Need to rent a dumpster in Austin today at a price you can afford? Our versatile dumpsters sizes allow you to choose the dumpster that will fulfill all of your needs depending on the weigh of your debris. It can be confusing the first time you rent a dumpster container because you may not know what size you will need. You can call our knowledgeable staff, or look below to assist you in choosing the ideal container. Holds 10 cubic yards which is equivalent to about 3 pick up truck loads of debris 13' by 8' by 3 1/2'. Great for household cleanups. Holds 12 cubic yards equivalent to about 4 1/2 pick up truck loads of debris 13' by 8' by 4'. Great for small renovation projects. In need of a Budget Dumpster Rental for Your Home or Business? Residential roll off dumpsters are great for household clean outs or clean-ups, waste removal and general junk removal with flexible rental periods. If you are doing some decluttering or getting rid of old household items, we can help. Residential dumpsters can be filled with all types of furniture, carpet, tables, chairs, boxes, clothes, toys, appliances, attic waste disposal, garage debris, and more. Construction Dumpster Rentals in Austin TX: Roll off commercial dumpsters for construction debris are perfect for any home renovation job from a small bathroom remodel up to the construction of a large building project. Construction dumpsters, or debris boxes, can be used for all types of building materials such as drywall, flooring, tile, lumber, windows, glass, siding, and more. We have some of the most competive dumpster prices in Austin. Roofing Dumpsters: Just as the name implies, roofing dumpster rentals are used for shingles and sheathing only. Depending on the weight of your debris, we offer different roll-off container sizes for roofing projects at affordable rates to help keep costs low. Rent a Dumpster for Yard Waste: If you are doing yard work and need a roll off container for yard waste, we have you covered. Temporary dumpsters are perfect for cleanup projects that involve shrubs, grass clippings, small branches, and leaves. Doing some spring cleaning and have too much waste for your curbside Rubbermaid trash can? There are certain types of jobs that dumpster rental is a must need which would be home renovations, construction sites, roofing jobs, cleaning out your garage, etc. 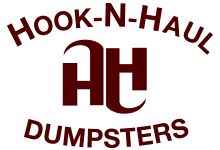 If you are new to renting a roll off dumpster, have no fear because Hook-N-Haul Dumpster Rental makes the process very simple and is below the national average cost to rent. There are a few things to take into account when you need to schedule a residential Dumpster Rental. 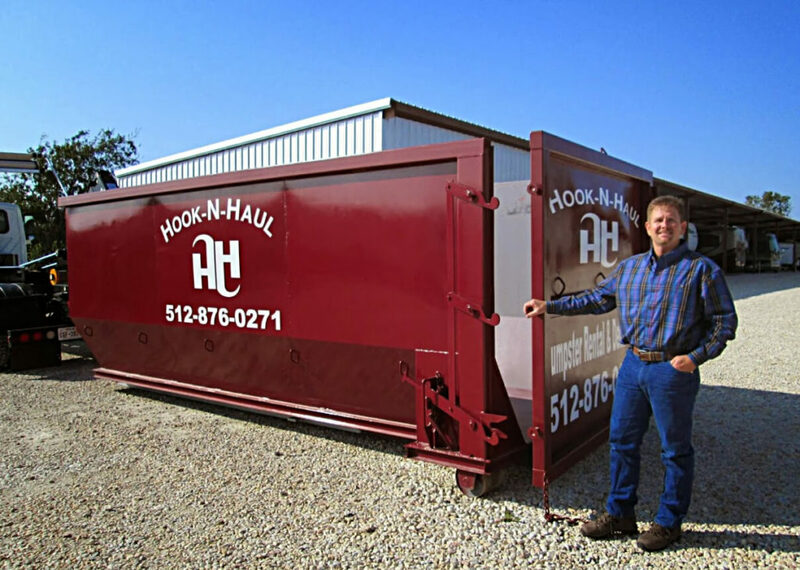 We are an Austin-based locally-owned Dumpster Rental Service, providing a hook lift system for our dumpster rentals in Austin area. We are fully insured and CDL Licensed in TX. Are you in need of a roll-off dumpster for waste managements? We are your best choice when it comes to quality customer service at an affordable cost to rent. Whether you need a dumpster for your home, business, or a contractor requiring it for a job site we have you covered. We offer a variety of sizes of roll off dumpsters to cater to any size job. Dumpster rental prices depend on what project you need it for and how much waste you are producing. When deciding on a dumpster rental you need to understand the different sizes and weight limits we offered to ensure that you are getting a dumpster large enough to contain the amount of waste you have. Requesting a dumpster that is too small for your solid waste can cause a customer to either stuff it full and go over the weight limit or have to rent a whole other dumpster to finish the job when you could have just upgraded a size up. If you are unsure about the size of dumpster you will need, then give us a call we would be happy to guide you to the right dumpster rental for your job and rental pricing. "I have used you guys for two full size dumpsters in the past month for construction debris, and just wanted to thank you and let you know I appreciate you and your driver's kindness and professionalism. Well done!!" "I love this junk removal company! Everyone was extremely polite and helpful. Fast service and great prices." "Hook N Haul dumpsters is a very professional company. I called them on short notice and they came right out on time the very next day with a 20 yard dumpster. "